Jhin is a meticulous criminal psychopath who believes murder is art. Once an Ionian prisoner, but freed by shadowy elements within Ioniaâ€™s ruling council, the serial killer now works as their cabal’s assassin. Using his gun as his paintbrush, Jhin creates works of artistic brutality, horrifying victims and onlookers. He gains a cruel pleasure from putting on his gruesome theater, making him the best choice to send the most powerful of messages: terror. For years, Ioniaâ€™s southern mountains were plagued by the infamous â€œGolden Demon.â€ Throughout the province of Zhyun, a monster slaughtered scores of travelers and sometimes whole farmsteads, leaving behind twisted displays of corpses. In desperation, the Council of Zhyun sent an envoy to beg Great Master Kusho for help. Upon hearing of the regionâ€™s plight, Kusho feigned an excuse for why he couldnâ€™t help. But a week later, the master, his son Shen, and star apprentice Zed, disguised themselves as merchants and moved to the province. In secret, they visited the countless families emotionally shattered by the killings, dissected the horrific crime scenes, and looked for possible connections or patterns to the murders. Depicted in a variety of plays and epic poems, the capture of the â€œGolden Demonâ€ would be the seventh and final great feat in the illustrious career of Lord Kusho. On the eve of the Blossom Festival in Jyom Pass, Kusho disguised himself as a renowned calligrapher to blend in with the other guest artists. Then he waited. Everyone had assumed only an evil spirit could commit these horrifying crimes, but Kusho had realized the killer was an ordinary man. The famed â€œGolden Demonâ€ was actually a mere stagehand in Zhyunâ€™s traveling theaters and opera houses working under the name Khada Jhin. When they caught Jhin, young Zed marched forward to kill the cowering man, but Kusho held him back. Despite the horrors of Jhinâ€™s actions, the legendary master decided the killer should be taken alive and left at Tuula Prison. Shen disagreed, but accepted the emotionless logic of his fatherâ€™s judgment. Zed, disturbed and haunted by the murder scenes he had witnessed, was unable to understand or accept this mercy, and it is said a resentment began to bloom in his heart. Outside the prison, Ionia fell into turmoil as the Noxian empireâ€™s invasion led to political instability. War awoke the tranquil nationâ€™s appetite for bloodshed. The peace and balance Kusho had famously fought to protect was shattered from within as dark hearts rose in power and secret alliances competed for influence. Desperate to counter the power of the ninja and Wuju swordsmen, a cabal within the ruling council conspired to secretly free Jhin and turn him into a weapon of terror. 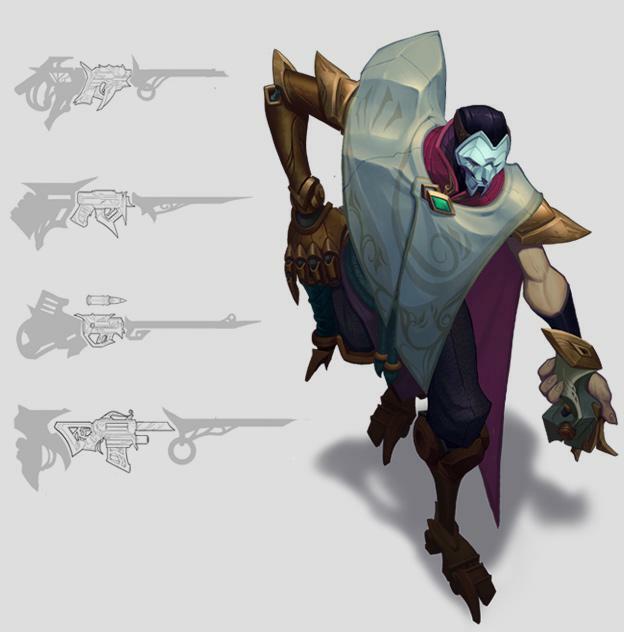 [ Note ] You can find a complete preview of Jhin HERE. He comes out next week! We started with a blank page, and ended with a killer. Here are the steps in between. Our initial goal was pretty clear: we wanted to deliver on a sniping fantasy that was notably different from Caitlynâ€™s long range gunning. If anything, her fast rate of fire and unlimited ammo aligns her closer to a semiautomatic rifle-wielding gunner, whereas we wanted to really explore what it felt like to use an old fashioned, bolt-action sniper rifle. We aimed for a champion who had slow and impactful shots, who could express skill through their long-range snipes, and whoâ€™d apply pressure with their shots even if they missed. One way or another, every shot would count. Early sketches focused on a mysterious robot cowboy bounty hunting sniper – not the easiest elevator pitch – but the concept quickly hit the proverbial icebox as we focused on other further developed concepts. A couple of champs progressed from concept into production, in fact, while our sniper chilled out in his icebox, including a certain death-centric duo. After we figured out Kindredâ€™s theme, we felt that a bounty system was a better fit for them, so pulled the mechanic from the sniper. Without the bounty hunting, we were still left with a mysterious robot cowboy sniper – still a cool idea, and still something we wanted to explore. So we came back, set on executing this long-range sniping fantasy. Initially, we just gave him a sniper rifle, but the range and speed still felt too close to Caitlyn, so we started thinking of ways to differentiate him. We eventually settled on the concept of a constructible weapon, something that looked like a short-range sidearm for basic attacks, but that could be assembled for long-range sniping with his abilities. The idea stuck, so August started looking at ways to necessitate planning and execution, emphasizing carefully timed and placed shots as opposed to your average marksmanâ€™s attack speed-fuelled barrage of withering basic attacks. 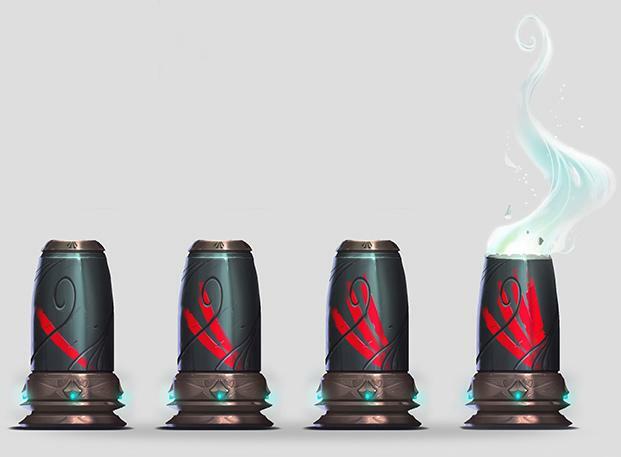 As we started discussing the concept internally, we quickly realized that the term â€œsniperâ€ felt wrong – there was just too much overlap with Caitlyn, and the term implied that everything he did would be at supreme range – so we started thinking about a better development term for the character. The term â€œDeadeyeâ€ fit perfectly, encompassing aspects of a long range killer without the excess baggage that came with the sniper term. August started diving into this Every Shot Counts idea, and implemented an ammo system for his basic attacks. Meanwhile, Deadly Flourish quickly turned into the longest range basic ability in the game, but would be most effective when his allies had already marked his target. This was our attempt to bring the feeling of spotting – where others call out targets for their sniper to shoot – to League! Whatâ€™s more, Deadly Flourish, along with Curtain Call, tied into the sniping fantasy much better, because they cover huge range, but most importantly, can miss. This added a ton of skill into the abilities, of course, and would mentally affect Deadeyeâ€™s target even if he didnâ€™t land his shot. Youâ€™ve seen movies where soldiers run for cover after a sniper takes his first shot, and that was a heavy inspiration for the feel we wanted to convey with Deadeye. Deadly Flourish was our attempt to bring the feeling of spotting – where others call out targets for their sniper to shoot – to League. August fixed Deadeyeâ€™s ammo count to four – the low number meant that every shot count, and meant we could ramp up the damage so that, well, every shot hurt, too – and we liked the idea of the fourth shot being the deadliest from a mechanics perspective. But why would Deadeye save his most powerful shot for last? We started looking at his character, and actively turned the number four into a common repeating motif for him. Deadeye doesnâ€™t want to just kill you – he wants to kill you perfectly by slowly building up to a sublime death. Odin started thinking of Deadeye as an artist, and built in references to music – specifically opera – in his voice lines and personality. We doubled down and repeated four as a key number in his kit, with four bounces on his grenades, and four Curtain Call shots. We found that this actually echoes well with our own world, where the word â€œfourâ€ sounds like the word â€œdeathâ€ in Chinese, and is, because of that, a deeply feared and unlucky number in many parts of Asia. It was perfect for Deadeye. Deadeye needed to appear human, appear normal, only to realize as you drew closer that something was off. Really off. Why the hump? What was that thing? It formed a strong point of curiosity for us that we loved, alongside the constructible gun. Next Larry drew up some animation studies, and we saw what the hump actually was – part of his weapon – and how he moved. Stakeholders were instantly onboard, so we iterated further, turning Deadeye into a darkin, then a woman. Next we tried Ionia, and immediately found traction with their ornate architecture and form over function design ethos. Settling there, we elongated his body and turned his mask into a real intricate work of art. We steered away from robotics because it lacked the elegance that Deadeyeâ€™s character was fast developing, and didnâ€™t click with his burgeoning feel. In fact, we knew the character was turning into a pretty nasty killer, but in order for him to be truly terrifying, we wanted him to look approachable. Deadeye needed to appear human, appear normal, only to realize as you drew closer that something was off. Really off. We came to call this â€œThe Lieâ€. Odin continued refining Deadeye – now named Jhin – into a monster. But not the Rekâ€™Sai-style rip-your-head-off-and-eat-your-heart kind of monster. We wanted Jhin to be a real psychopathic killer, someone who you could interact with, but who wasnâ€™t all there. He seems to be smiling, but heâ€™s not: thatâ€™s just his mask. Jhin searches for a justification for doing what he does, and similar to Dexter, Deadeye might appear normal, but is a true monster inside, hellbent on his art and giving his victims the perfect death. We were on the home stretch. 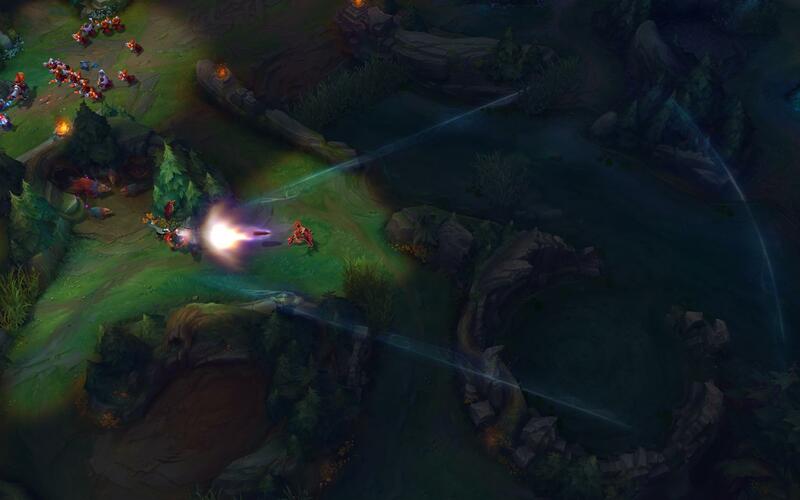 We took a look at Jhinâ€™s weapons, and aimed specifically at creating magical guns rather than strictly ballistic weapons. Hammering home his artistic aspirations, we looked at Jhinâ€™s rifle, and added a fountain pen-like nib to its barrel. Finally, we applied a color pass to him, and decided to give him bright, lively shades that emphasized his peacocking. His main three shades – purple, white, and gold – directly reference roman emperors, so while Jhinâ€™s very much equipped to kill, heâ€™s also dressed to impress. 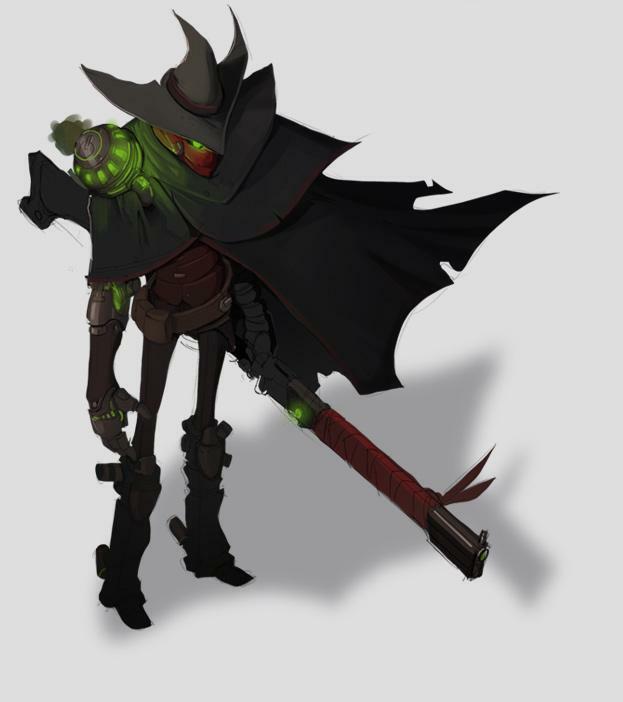 Finally, and this isnâ€™t normally something we reference in these articles, but that original robot cowboy concept did actually make its way onto the Rift. Itâ€™s his launch skin – High Noon Jhin – a nice little hat-tip to the original concept that created the Virtuoso. While Jhinâ€™s very much equipped to kill, heâ€™s also dressed to impress. Weâ€™ll be back soon for Jhinâ€™s Q&A session, so get your questions ready for the Rioters who created him!